Welcome to the Deer Forest Lodge, your home away from home, nestled in the heart of Virginia’s Shenandoah Valley! 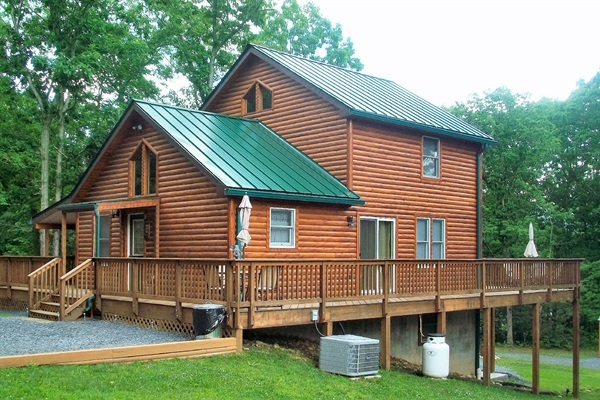 No matter the season or the reason that brings you to the beautiful Shenandoah Valley, the brand new Deer Forest Lodge; 4 bedroom, 3 story log cabin can meet all of your accommodation needs. While we are located in the heart of the Shenandoah Valley and walking distance to the Shenandoah River and Outfitters where the river fun never seems to end! Enjoy tubing, canoeing, kayaking, rafting, fishing and swimming. There are also 5 public river access areas for the do it your-selfer's! The breathtaking Luray Caverns, and the BEAUTIFUL Shenandoah National Park, scenic mountain horseback riding and our up and coming famous Virginia wineries are just minutes away. There are endless hiking trails and every road seems to be right off a post card. Ski country is only a 40 minute drive, rather it is Bryce Resort or Massanutten Resort. If the river or slopes or other nearby attractions aren't on your mind or your visit falls during the other stunning times to visit Virginia, you can enjoy biking, shopping, golfing, and vineyard touring or maybe a personal river cruise. But back at the Lodge, we invite you simply to relax and chat with friends and family, shoot pool, grill out on the wrap around deck and just enjoy this perfect location. We make sure any trip to this area and to the Lodge is just what you desire and we are just a phone call away to help your vision become a reality. Whether you are on-the-go or taking it slow, we invite you to spend some time in the game room, a perfect way to relax after a long day. After a restful night's sleep, you'll be ready to start another day of adventure and exploration in the Shenandoah Valley, Blue Ridge and Massanutten Mountains! And should you need help finding that perfect activity, please allow us to help you figure it all out! With other lodging by Shenandoah Rentals less than a minute away, you can't find a better place for your family reunion. The kitchen is fully equipped with new full sized appliances. All dish and cookware and utensils, coffee maker/filters, microwave, dishwasher, toaster, blender, slow cooker, ice maker. Dining outside on the wrap around deck seats eight. Kitchen seats five with new TV trays as needed. Enjoy grilling out on the deck with the new gas grill! Garbage bags, paper towels and bathroom tissue are supplied. The game room is located in full walk out basement. New pool table (must not be moved from its current location). There is also a wine/beverage cooler and TV. The sofa in the game room is a queen sleeper sofa. There is also the 4th bedroom with a new full bed. The half bath is also located in the game room. Also included are a variety of spices, etc. For the young (also the young at heart), there is hot chocolate mix and microwave popcorn! PLEASE NOTE: The hot tub will be closed for the winter. After December 3rd, there WILL NOT be a hot tub available for use.